The Christian doctrine of the Trinity, and in particular the theology of "the consubstantiality of the Son with the Father," is crucial to Stephen's understanding of himself and his art. Both Telemachus and Proteus show him meditating on this relationship, and in Scylla and Charybdis he advances a reading of Shakespeare's Hamlet that relies upon what Haines calls “The Father and the Son idea. The Son striving to be atoned with the Father.” In this arcane personal mythology, Mulligan plays the part of a heretic, a modern representative of a "brood of mockers" who denied the mystery of the Trinity: Valentinus, Sabellius, Arius, and Photius. One central mystery of Christian doctrine, Incarnation, reconciles the humanity and the divinity of Christ. Another, the Trinity, reconciles the divinity of Christ with the divinity of God. To early theologians Jesus of Nazareth was clearly different from the "father" in heaven whom he mentions or addresses often. But he was also divine, and in a monotheistic religion he must therefore be identical with the invisible God in heaven. This contradiction exercised the best minds of the early Christian church, and it doubtless troubles many believers still. (Nora Barnacle, who was more religious than her partner, nevertheless asked him in perplexity, “Jim, is Jesus and God the same?”) Ingenious theologians came up with a solution: Father and Son (and also Holy Spirit) are different Persons, but they are united in a single divine nature, or "substance." 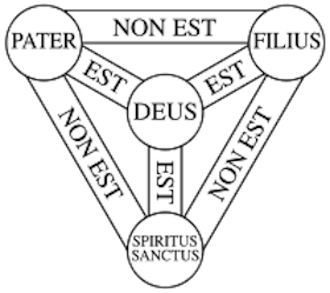 The Trinitarian doctrine enshrined in the Nicene Creed was illustrated in the later Middle Ages in the image of a Scutum Fidei or Shield of Faith: a triangle showing that the Persons are distinct from one another but all the same God. Accompanying text often made clear that Father is not Son and Son is not Father, but both are God. Stephen thinks in Telemachus of four “heresiarchs” (great heretical leaders of the early church) that threatened orthodox Trinitarian doctrine. The earliest of these, Valentinus, hails from the 2nd century, when the early church was only beginning to differentiate its teachings from those of the Gnostics. Gnosticism regarded the material world as evil, and described salvation as a matter of escaping that evil realm of matter. Although Valentinus thought of himself as a Christian, he was also a Gnostic, and taught that the world had been created not by God but by a quasi-Platonic Demiurge—a malevolent one. Christ came to liberate mankind from materiality, but since he was God, and good, he could not be thought to participate in any way in that materiality. He was therefore conceived as purely spiritual, not incarnate. Stephen thinks of “Valentine, spurning Christ’s terrene body” and thus breaking the Christological link between physical humanity and spiritual essence expressed in the doctrine of Incarnation. "Sabellius," an influential theologian of the 3rd century about whom little is known today, opposed early Trinitarian thinking very directly. He denied the threefold quality of the deity absolutely, arguing that the persons were simply personae: masks, faces, external aspects. Human believers looked at the incarnate Son who was crucified and resurrected and saw something very different from the unapproachable Ancient of Days who had laid the foundations of heaven and earth. But in themselves these two Persons, and likewise the Holy Spirit, were simply one God who chose to manifest himself in different ways. By this logic, Tertullian objected, the Father could be said to have suffered on the cross just as the Son did, since they are essentially the same. Stephen, recalling the “Words Mulligan had spoken a moment since in mockery to the stranger” (that Stephen “proves by algebra that Hamlet’s grandson is Shakespeare’s grandfather and that he himself is the ghost of his own father”), muses wryly that the “subtle” Sabellius “held that the Father was Himself his own Son.” This probably makes Sabellius a bit more subtle that he actually was, since his point was simply to deny that the terms Father and Son named anything essential. "Arius," who figures also in Proteus, lived in the late 3rd and early 4th centuries. 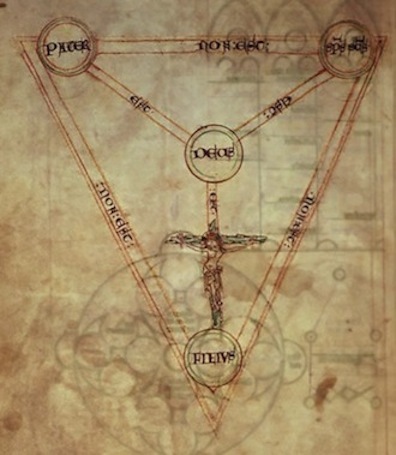 He conceived the Persons of the Trinity in an essentially Neoplatonic manner, as hierarchically ranked processions. God the Father, “the only true God,” first created the Logos (the pre-incarnate Son) “out of things nonexistent.” The Logos similarly created the Holy Spirit. The Holy Spirit in turn created the material world. Arian teaching thus subordinated the Son to the Father. It was espoused by many of the Germanic tribes (Goths, Lombards, Vandals) and by many people within the Roman empire: ordinary believers, priests, bishops, nobles, even some emperors. The vigorous contest between Arianism and Trinitarianism was decisively resolved at the first council of Nicaea (325), which condemned Arianism as a heresy and promulgated the view that (in the words of the Nicene Creed) the Son was “begotten, not made, being of one substance with the Father.” Originally written in Greek, the Creed used the word homoousion to indicate that Father and Son shared the same ousia or essential, immaterial being. The Greek term was translated into Latin as consubstantialem, meaning “of the same substance.” Stephen affirms this crucial element of the Nicene Creed when he thinks of Arius “warring his life long" upon the doctrine of consubstantiality. The Holy Spirit was not so central as the Father and Son to the early church’s theological bridging of heaven and earth, but the ways in which people conceived of it in relation to the other two Persons proved crucial in the second half of the 9th century, when the Catholic and Orthodox churches began to pull apart from one another. "Photius" is regarded in the eastern churches as a great father who defended traditional doctrine from a Roman heresy. In the west he is viewed as an arch-heretic. As Thornton notes, the Catholic Encyclopedia describes him as "one of the worst enemies the Church of Christ ever had." The schism that formally separated these two great branches of Christianity in 1054 had deep roots stretching back to the division of the Roman empire and the collapse of the western half. As Patriarch of Constantinople, Photius opposed the Pope in Rome over questions of political authority and also over Rome’s effort to add a single word to the Nicene Creed, filioque (“and from the Son”). 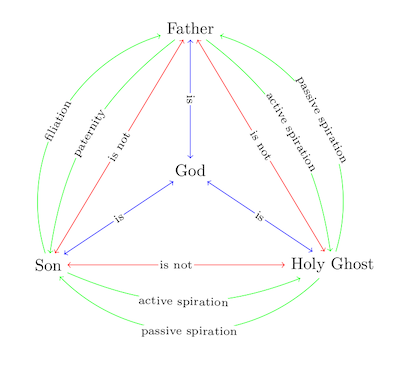 This word had been circulating for several centuries in the west, and the Romans wanted the creed amended to make clear that the Holy Spirit proceeds both “from the Father and from the Son.” The Greeks in Constantinople, relying on the creed as written, affirmed that the Spirit proceeds from the Father alone. From Stephen’s perspective, the Orthodox position is regrettable because it accords primacy to the Father, whereas Catholic doctrine affirms the potency of Father and Son equally. Telemachus identifies Stephen symbolically with Telemachus and Hamlet, two unhappy sons devoted to absent fathers. Like Hamlet and Telemachus, Jesus was a young man in the familiar human world whose life had meaning in relationship to a ghostly, absent father. This relationship suggests how human life might be made to express spiritual possibilities—a central concern of Stephen’s aesthetics. Earliest attested representation of the Scutum Fidei, a detail from an illustration to the Compendium Historiae in Genealogia Christi by Peter of Poitiers (Cotton Faustina ms. B. VII, folio 42v), ca. 1210. Source: Wikimedia Commons. A modern version with the words written legibly. Source:Wikimedia Commons. 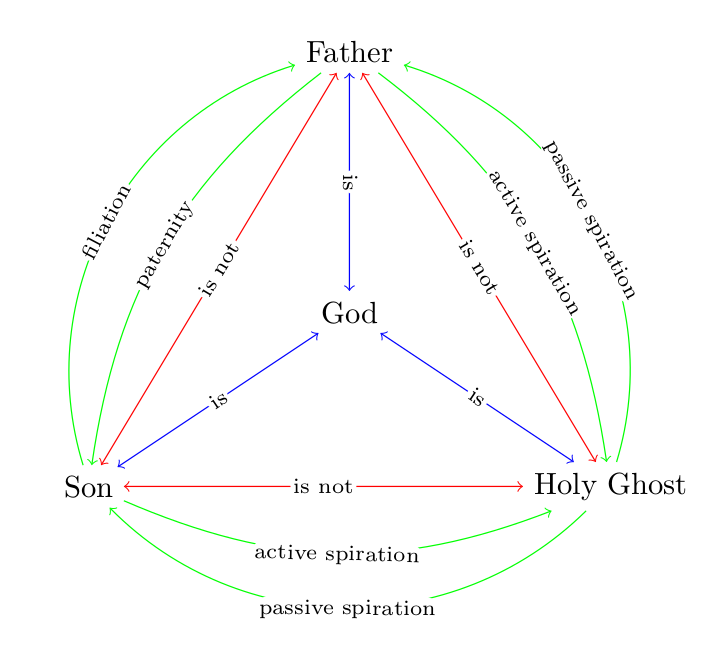 A more complicated diagram adding theological terms for the relationships that exist between the different Persons. Source: christianity.stackexchange.com. 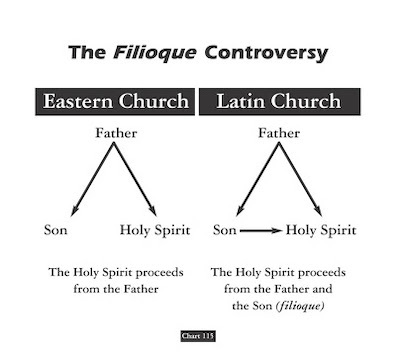 Chart diagramming the argument between the western and eastern churches. Source: forums.anglican.net. 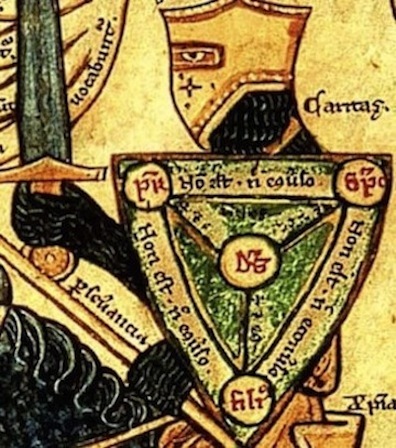 Detail from the Summa Vitiorum or Treatise on the Vices by William Peraldus (Harleian ms. 3244, folios 27-28), showing a knight allegorically shielded from dangerous sins by the Scutum Fidei. Source: Wikimedia Commons.